Count on our staff in Cincinnati, Ohio for exceptional outdoor plumbing service and repair. We specialize in outdoor plumbing, sewer, water line repair, and excavation services. Marshall Plumbing & Backhoe Service is proud to provide underground utility and outdoor plumbing repair and excavation services. Family-owned-and-operated since 1971, we are known for our experienced staff that gets the job done right the first time, and Jeff Marshall personally performs all work. Contact Greg and Jeff at (866) 919-5115 to learn more about our outdoor plumbing repair and excavation business. Each job we perform is unique, so we provide free estimates on your job and provide you with a competitive price. 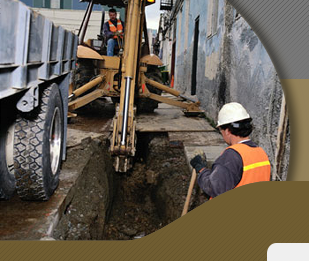 In addition to our plumbing and new construction services, we offer total backhoe service and footer digging. Our company was founded by Bill Marshall in 1971 and then taken over by his sons Greg and Jeff to keep the business in the family. Our hard work and craftsmanship is what keeps our customers coming back to us. We work with some of the larger homebuilders of the Cincinnati area. All work is performed and supervised by Jeff Marshall. Call Greg and Jeff today at (866) 919-5115 for service or consultation on sewer repairs and backhoe excavation services.